Backtrack is about to be a new performance tool, focused on revealing and solving scheduling and delay problems. Those are big offenders of performance, very hard to track, and hidden from conventional profilers. To find out how long and what all has to happen to reach a certain point – an objective, just add a simple instrumentation marker. When hit during run, it’s added to a list you can then pick from and start tracing to its origin. Backtrack follows from the selected objective back to the originating user input event that has started the whole processing chain. The walk-back crosses runnables and their wait time in thread event queues, but also network requests and responses, any code specific queues such as DOM mutations, scheduled reflows or background JS parsing 1), monitor and condvar notifications, mutex acquirements 2), and disk I/O operations. Visually the result is a single timeline – we can call it a critical path – revealing wait, network and CPU times as distinct intervals involved in reaching solely the selected objective. Spotting mainly dispatch wait delays is then very easy. The most important and new is that Backtrack tells you what other operations or events block (makes the critical path wait) and where from have been scheduled. And more importantly, it recognizes which of them are (or are not) related to reaching the selected objective. Those not related are then clear candidates for rescheduling. To distinguish related and unrelated operations Backtrack captures all sub-tasks that are involved in reaching the selected objective. Good example is the page first paint time – actually unsuppress of painting. First paint is blocked by loading more than one resource, the HTML and head referenced CSS and JS. These loads and their processing – the sub-tasks – happen in parallel and only completion of all of them unsuppresses the painting (said in a very simplified way, of course.) Each such sub-task’s completion is marked with an added instrumentation. That creates a list of sub-objectives that are then added to the whole picture. Backtrack could be used in our perfomance automation. Except calculation of time between an objective and its input source event, it can also calculate CPU vs dispatch delays vs network response time. It could also be able to filter out code paths clean of any outer jitter. Indeed, networking has strong influence to load times. Adding more detailed breakdown and analyzes how well we schedule and allocate network resources is one of the next steps. 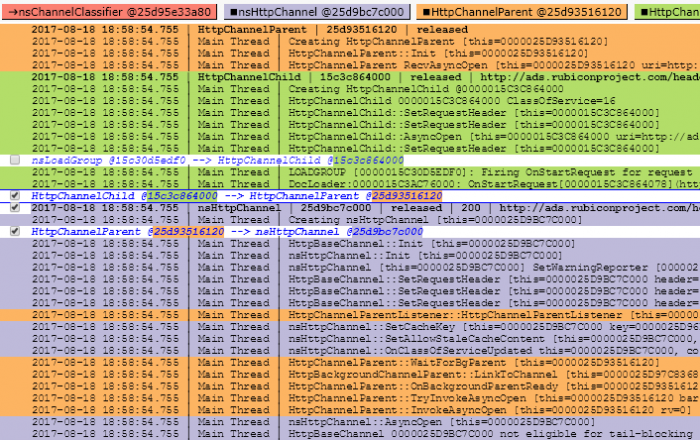 Adding PCAPs or even let Backtrack capture network activity like Wireshark directly from inside Firefox and join it with the Gecko Profiler UI might help too. The current state of Backtrack development is a work in active progress and is not yet available to users of Gecko Profiler. There are patches for Gecko, but also for the Cleopatra UI and the Gecko Profiler Add-on. The UI changes, where also the analyzes happens, are mostly prototype-like and need a clean up. There are also problems with larger memory consumption and bigger chances to hit OOMs when processing the captured data with Backtrack captured markers. Backtrack aims to show a complete code path flow from any point back to its source, crossing asynchronous callbacks, threads, processes, network requests, timers and any kind of implementation specific queuing plus capturing any I/O or mutex blockade. The ‘critical flow execution path’ is put to a context of all the remaining concurrent execution flows. It’s then easy to examine how the critical flow is blocked and delayed by concurrent tasks. The work is tracked in this bug, where you also find patches and build instructions. There is also an add-on that, in Backtrack enabled builds, allows you to view actual captured data. 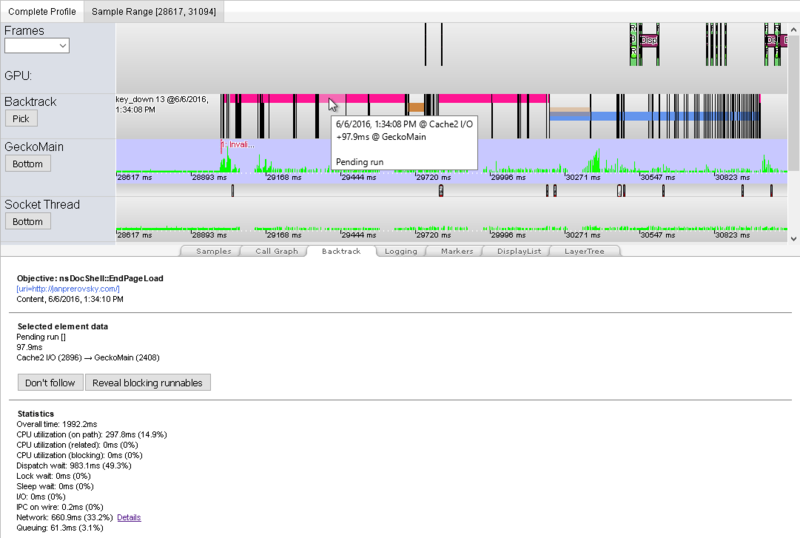 Backtrack combines*) Gecko Profiler and Task Tracer. 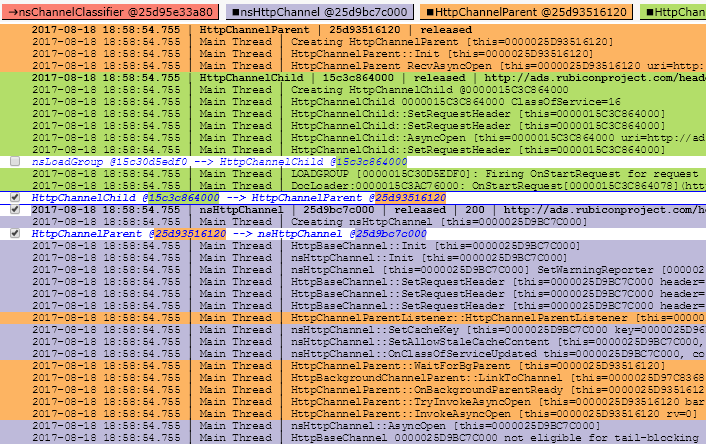 Task Tracer (TT) on the other hand provides a generic way to track back on runnables – but not on e.g. network poll results, network requests or implementation specific queues. It was easy to add a hook into the TT code that connects the captured object inter-calls with information about runnables dispatch source and target. Binds code-specific queuing and dequeuing, like our DNS resolver, HTTP request queues. Those are not just ‘dispatch and forget’ like nsIEventTarget and nsIRunnable but rather have priorities, complex dequeue conditions and may not end up dispatched to just a single thread. These queues are very important from the resource scheduling point of view. Disadvantages: just one – significant memory consumption. *) The implementation is so far not deeply bound to SPS and TT memory data structures. I do the capture my own – actually a third data collection, side by SPS and TT. I’m still proving the concept this way but if found useful and bearable to land in this form as a temporary way of collecting the data, we can optimize and cleanup as a followup work. Yes, it’s on! After a little bit more than a year of a development by me and Michal Novotný all bugs we could find in our labs, offices and homes were fixed. The new cache back-end is now enabled on Firefox Nightly builds as of version 32 and should stay like that. The old cache data are for now left on disk but we have handles to remove them automatically from users’ machines to not waste space since it’s now just a dead data. This will happen after we confirm the new cache sticks on Nightlies. The new HTTP cache back end has many improvements like request prioritization optimized for first-paint time, ahead of read data preloading to speed up large content load, delayed writes to not block first paint time, pool of most recently used response headers to allow 0ms decisions on reuse or re-validation of a cached payload, 0ms miss-time look-up via an index, smarter eviction policies using frecency algorithm, resilience to crashes and zero main thread hangs or jank. Also it eats less memory, but this may be subject to change based on my manual measurements with my favorite microSD card which shows that keeping at least data of html, css and js files critical for rendering in memory may be wise. More research to come. Thanks to everyone helping with this effort. Namely Joel Maher and Avi Halachmi for helping to chase down Talos regressions and JW Wang for helping to find cause of one particular hard to analyze test failure spike. And also all early adopters who helped to find and fix bugs. Thanks! Number of kBs we reserve for keeping recently loaded cache entries metadata (i.e. response headers etc.) for quick access and re-validation or reuse decisions. By default this is at 250kB. Number of data chunks we always preload ahead of read to speed up load of larger content like images. Currently size of one chunk is 256kB, and by default we preload 4 chunks – i.e. 1MB of data in advance. Since these tests are pretty time consuming and usually not very precise, I was only testing with page 2 of my blog that links some 460 images. Media storage devices available were: internal SSD, an SDHC card and a very slow microSD via a USB reader on a Windows 7 box. Edit: I found one more place to optimize – preload of data sooner in case an entry has already been used during the browser session (bug 1013587). We are winning around 100ms for both first paint and load times! Also stddev of first-paint time is smaller (36) than before (80). I have also measured more precisely the load time for non-patched cache v2 code. It’s actually better. * We are not keeping any data in memory (bug 975367 and 986179) what seems to be too restrictive. Some data memory caching will be needed. The way I have measured browser UI jank (those hangs when everything is frozen) was very simple: summing every stuck of the browser UI, taking more then 100ms, between pressing enter and end of the page load. All load time values are medians, jank values averages, from at least 3 runs without extremes in attempt to lower the noise. 1) Open a new tab and navigate to a page right after the Firefox start. 2) Open a new tab and navigate to a page that has already been visited during the browser session.